Rocky Guides are the key ingredient to our world-renowned trips. 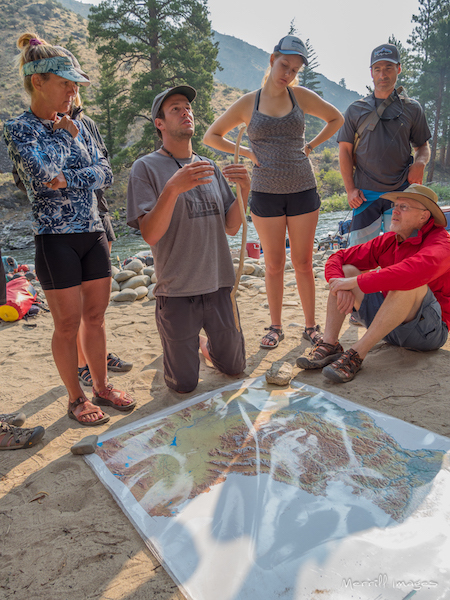 They are an inspiring group of people that feel the Middle Fork is their home and love having guests. Their hospitality, professionalism, work ethic and overall ability to have a good time is second to none. They are smart, strong, experienced and beautiful people that love to share their passion for Idaho’s world-class wilderness rivers. How do you find such great people? This is a common guest question following a magical week on the river with one of Rocky’s exceptional guide crews. We only hire well rounded, hard-working, educated individuals that are excited about life and a big contagious smile on their face. We are very lucky at Rocky Mtn River Tours, see we have this guide tree out back. Whenever we shake it really hard, it produces the best guides in the business. All kidding aside, most of our guides start working as a day-trip guide for our Sawtooth Adventure Company and its Sun Valley clientele. The Sun Valley visitor is knows for its high expectations, and SAC has earned a reputation for exceeding them. Following a number of successful seasons day guiding, and multi-day training the cream rises to the top. The guys and girls that have proven their ability to connect with all types of people, be a role-model for kids, work hard with a smile on their face, love their coworkers and safely navigate the biggest rapids in the West are invited to join Rocky’s extraordinary, multi-day crews on the River of No Return and Middle Fork of the Salmon. If you love people, good food, fun times and high quality wilderness give us a ring. We are always looking for great people.